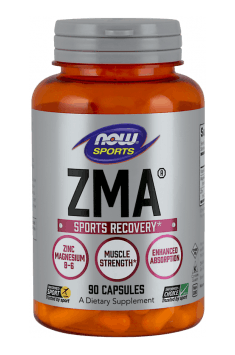 ZMA® is a combination of Zinc, Magnesium and Vitamin B-6 designed to maximize absorption and to promote recovery from exercise. Zinc plays a central role in the regulation of cellular growth and tissue repair, as well as the maintenance of a healthy immune system. Magnesium is essential for the maintenance of electrolyte balance, energy production and normal neuromuscular function. Because physical activity can increase the need for these two minerals, ZMA® is the ideal supplement to aid in their replenishment. 3 capsules per day on an empty stomach, about 30-60 minutes before bedtime. Extremely good combination of key mineral anabolic. Their effect is clinically proven. With optimum content of zinc, magnesium and vitamin B6, it naturally regulates testosterone levels in the body, improves durability and positively affects libido. According to the manufacturer, you should take 3 capsules a day. This product stimulates the secretion of testosterone. That's why men usually take it. ZMA also has positive effects on the female body. A suggested dose for a woman will be 2 capsules a day. I recommend taking it on an empty stomach, in the evening, preferably 30-60 minutes before bedtime. Magnesium contained in the product has a sedative effect and improves the quality of sleep. People using ZMA at night say that they sleep better, wake up refreshed and regenerated. It should not be combined with food and supplements containing calcium, because it blocks the absorption of zinc. There are no clear studies that say how long you can take ZMA for. It argues gently testosterone levels. After a month of use you can take a short break. Bovine Gelatin (capsule), Rice Flour and Magnesium Stearate (vegetable source). Asparaganian magnesium (chelate magnesium and aspartic acid) is an organic magnesium form characterized by absorption and stability in the body. Magnesium is actively involved in energy conversion (necessary in the process of ATP). Intracellular cation, stored in the bones, partly in soft tissues and minimal quantity in the extracellular fluid. Maintains a proper bone structure, nucleic acids and chromosomes. It is an activator of enzymes involved in the synthesis of protein, stabilizes cell membranes, conducts nerve impulses and increases contractility of nerve fibres. Deficiencies of magnesium in the body are causing disorder of the immune system and water-electrolyte balanace, causing greater susceptibility to stress, irritability and insomnia. Magnesium deficiency can cause cardiac arrhythmias, uncontrolled muscle contractions, numbness in the limbs. Asparganian Magnesium is a component of the mineral preparations (including ZMA), vitamin and mineral and pro-testosterone supplements used in sports supplementation. Dosage: based on Mg ions, 100-500 mg per day.